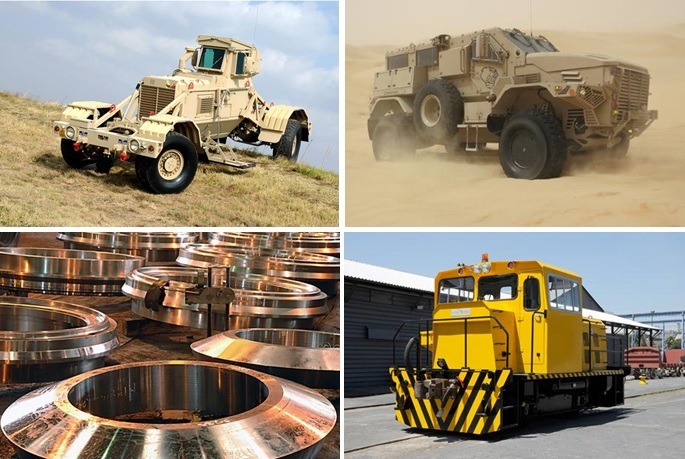 DCD is an international manufacturing and engineering company providing products and solutions to the rail, defence, mining & energy and marine sectors. It comprises eleven businesses, each focussed on a manufacturing niche and a recognised leader in its field. The companies are long-established with the oldest in the group having been in operation for over 100 years. As a group DCD is able to offer comprehensive, integrated heavy engineering solutions in addition to individual solutions at each company. DCD has been an integral participant in South African infrastructure development for decades and is now playing an active role as a partner of choice to government in the current infrastructure expansion drive. Its engineering expertise and world class facilities are supported by innovative design capability. Market-leading R&D is a central focus. With its head office in Vereeniging, South Africa, the group employs approximately 1600 people across the country. DCD Defence is represented by DCD Protected Mobility, the OEM of the Vehicle Mounted Mine Detector (“VMMD”) system. The company has established itself as a fully accredited, socially responsible international systems house, providing sustainable products for the defence sector by developing intellectual property in partnership with governments, customers and communities. The range of mobile landmine detection vehicles and armoured personnel carriers has been deployed in peacekeeping missions across the globe for the past 30 years and has been tested in accordance with NATO standards in the USA and France. DCD Protected Mobility has the following certifications: SABS ISO 9001:2008 Quality and Management Systems; Intertek BS EN ISO 14001:2004 Environmental Management Systems; Intertek BS OHSAS 18001:2007 Occupational Health and Safety Management Systems. DCD Rail provides manufactured products to the rail industry, with the range encompassing train tyres, train brakes and rolling stock such as mainline locomotives, mining and industrial trains and trams. The cluster comprises: DCD Rolling stock; DCD Ringrollers; DCD Metpro. The companies are established preferred suppliers to rail groups and parastatals both locally and internationally. DCD’s Mining & Energy cluster offers products and components for mining activities and power generation plants including coal, hydro, wind and nuclear. Companies in the cluster have supplied components to all coal fired power stations erected in South Africa from the 1960’s to the 1990’s and are currently supplying new coal fired power stations, Medupi and Kusile. In addition they have been involved in all the nuclear energy projects in the country to date as well as hydroelectric plant. Further, the cluster has entered the wind towers market through the company DCD Wind Towers. DCD is the majority shareholder in the first South African manufacturer of multi-megawatt wind turbine components. The cluster comprises: DCD Heavy Engineering; DCD Venco; MSP (Mine support Products); DCD Wind Towers. The DCD Marine Cluster provides turnkey ship and rig repair solutions to the marine and oil & gas sectors with shipyard facilities in Cape Town, Walvis Bay, Saldanha, Ngqura, East London and Durban. The cluster comprises the following: DCD Marine Cape Town; EBH South Africa; EBH Namibia. The companies are established preferred suppliers to rail groups and parastatals both locally and internationally.